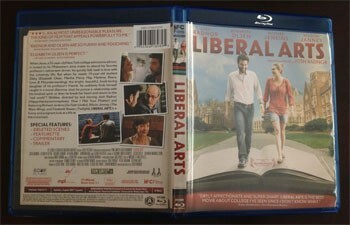 Liberal Arts's visual style shares many similarities to happythankyoumoreplease, unsurprisingly: static shots of characters sitting mid-contemplation, a steady but concentrated focus on characters conversing while walking, and subtly-lit, occasionally inventive warmth during interior shots to emphasize mood. It's fairly standard romantic-comedy fare with a careful, natural eye, and MPI Home Video's 2.35:1-framed HD treatment amply handles the small details of the photography. The weave in Jesse's laundry bag, blades of grass, and the fine details in clothing and close-ups are suitably in focus, and the flush of skin tones and other palette choices -- dreamy greens, stale wood colors in a college dining environment, dim oranges during a party -- suitably get the point across. Softness and flatness aren't uncommon here, though, where a few close-ups reveal processed textures and a faint haze, but they're balanced by the disc's positive traits. The most prominent and satisfying elements of Liberal Arts' sound design are in the music. Several sequences feature Jesse and Zibby getting lost in the crescendos and emotive fabric of the classics, where they "feel" what it does to them and changes their perspective, and the 5-channel Master Audio track flexes its muscle in this regard: the texture of the instruments' tone, the quiet lying outside their noise, and how it coexists with voiceover from the two. Outside of that, the front-heavy track's about what you'd expect: verbal clarity satisfies without delivering much in the way of impressiveness, occasional sound effects evoke a smidge of authenticity, and a lack of distortion keeps the experience feeling seamless. It does what it needs to do. English and Spanish optional subtitles are available alongside the sole English-language track. 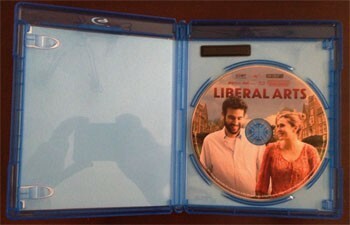 The main supplement here comes in the Audio Commentary with Josh Radnor and Producer Jesse Hara, which navigates the film pretty much scene-by-scene from a constructional perspective: they discuss the difference between the opening scene and what they originally planned, the Moby track they used, production decisions, and some of the associations between the movie and Radnor's experiences. From discussion about the college used (Radnor's alma-mater) to improvisation in the script and the photography, it's a laid-back but discerning commentary that, admittedly, fluctuates in energy. But it's also honest: I don't typically like to blurt out a direct quote from these things, but I admire Radnor's comment that his films couldn't "transcend a miscast" -- a true and modest evaluation of his perspective. Not too shabby. Also available are a slate of nine Deleted Scenes (16:30, SD) -- some of which are mentioned in the commentary, notably a break-up sequence originally slated for the beginning of the film -- as well as a quick press-kit Featurette (2:06, HD) and a suitable Trailer (2:30, HD). Josh Radnor touches on musings in Liberal Arts that he's explored before, namely the emotional confusion of growing into adulthood and the idea of rediscovering and harnessing life's overlooked pleasures, but he's sharpened his focus to a finer point in Jesse's fairly intimate story. Restraint and some practicality are woven into his idealized romance with a much-younger woman keen on vintage delights and contemporary literary confections -- and while convenient drama clouds Radnor's perspective, and the story's similarities to others of its ilk cannot be ignored, it's a mostly-delightful expression of confused maturation and those personal bonds that both defy and thrive on age differences. MPI's Blu-ray guides us through the college environment with keen eyes and ears, and the commentary available here is a comfortable, detailed one. Recommended.